When the Emperor Honorius withdrew the Roman legions from Britain in the year 410, there were many who thought the country's collapse was close at hand. The land was plagued by pirates - Saxons to the South and East, Picts to the North and Irish from the West. How could the Britons survive without the might of Rome to protect them? Later that year, Rome fell for the first time, while in Britain, Constantine the Strong - half-Roman, half-Briton - was crowned High King at Winchester. He made a new flag for the country - a red dragon on a gold background - and unfurled it for friend and foe to see from the highest tower in the city. He rallied the people, and for thirty years held all enemies at bay. But Vortigern, Prince of Gwynned, was jealous. He put poison in the High King's cup and killed him at the royal table. Vortigern was crafty. He had already won the support of a large number of nobles, promising them money and land and an easier life than they had ever had under Constantine. As soon as the High King slumped face-forward, Vortigern's men drew their swords and ran through the castle, searching for Constantine's two teenage sons, Ambrosius and Uther. But they were nowhere to be seen. It was only on the eve of his coronation that Vortigern learnt the truth. The boys had been spirited away on the night of the murder by a mysterious stranger, a tall young man in a red and blue cloak. They were in Brittany now, already plotting their return. Many leading Britons had joined them there. Vortigern, his reign barely begin, was consumed with anxiety. Sensing weakness, the Saxons thrust further inland than ever before, harrying Lincoln and the market towns of the East Midlands. The Picts stormed Hadrian's Wall again, while the Irish seized captives galore from the Welsh coast. Vortigern didn't know what to do. He wasn't the kind of leader who could inspire men to fight and die for him. 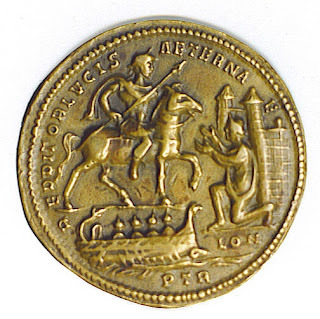 His usual ploy was to offer them gold, but now he had no gold to give as he was spending it all fighting the barbarians and protecting his throne from Constantine's sons. Vortigen followed their guidance. The foundations were dug and the stones laid up. At the end of the first day the tower was halfway built, but the very next morning the builders arrived and found their work in ruins. Blocks and shards of stone lay scattered and strewn all over the hillside. And it was like that every morning for fourteen mornings. The tower was built by day and cast down by night. Vortigern called back his druids and demanded an explanation. Vortigen groaned. He didn't believe a word of it, but felt he had no choice in the matter. So he sent his messengers far and wide and was surprised the next evening when two of them returned with a tall young man in tow. He had a thatch of black hair; dark, deep-set eyes; and a hawk-like nose. He stood before Vortigern in the throne room, carrying himself with dignity and pride, as if he were the king and Vortigern the subject. The setting sun slanted in through the high, narrow windows, lighting up the stranger's haughty face. 'Who are you?' growled Vortigern. 'Kill him at once, Sire,' hissed the Chief Druid in Vortigern's ear. 'The gods grow impatient. He is dangerous too. I smell a threat to your throne.' But Vortigern waved him away. He was curious, and greatly struck by Merlin's nobility of bearing and speech. Vortigen leaned forward. 'What things?' he whispered. So Vortigern ordered everyone outside. The tower, which was made of white stone, loomed above them in the sunset, half-finished as it always was at the end of each day. The builders grumbled when they were told to keep working, but it wasn't long before they had dug down past the foundations and not long after that when suddenly there was no more earth to dig. A vast, round cavern opened up below them, with bare brown earth in the middle and grey rocks around the sides. Two mighty dragons lay sleeping on the rocks, a white dragon to the left and a red dragon to the right. 'Light your braziers,' said Merlin to Vortigern's servants. The sun sank, the torches were lit, and straightaway the dragons awoke, rushed together in the centre of the cave and started to fight. They flailed, clawed and belched out fire all night long. The ground shook and the tower trembled. At first the white dragon had the advantage. He pushed the red dragon back to the rocks until, around the third watch of the night, the red dragon turned the tide and thrust the white dragon back in turn. As dawn approached it seemed certain that the white dragon would be killed but somehow he recovered his strength and charged the red dragon until they were locked together furiously in the middle again. The tower fell at last with a mighty crash, and then, once the sound of tumbling masonry had ceased, a bell began to ring, far-away but clear as crystal in the pre-dawn air. Vortigern knew the sound. It was the bell for Matins at Saint Martin's Monastery in Deganwy, over the mountains and by the sea. At the third chime the dragons turned away from each other, went back to their rocks and fell asleep at once. Vortigern ordered everyone back inside. Merlin stood before him in the throne room once again. 'What does all this mean?' asked the King. 'No peace?' Vortigern interrupted, but Merlin raised his right hand imperiously and carried on talking. There was an almighty commotion and the King's men rushed forward to lay hands on Merlin, but right at that moment the sun rose outside, arrowing in through the high windows and blinding their eyes. When they could see again, Merlin had vanished - gone entirely - as if he had never been in the room at all, as if his presence and prophecies had all been as insubstantial as a dream. That was exactly what Vortigern's druids told him. That it had all been a dream. But he had no more faith in them. He went to Deganwy instead and confessed his sins to the monks, repenting of the jealousy that had led him to kill Constantine. But everything fell out just as Merlin had predicted. Ambrosius and Uther landed at Falmouth three days later at the head of a great force. Three days after that and they were in Snowdonia, taking Vortigern's stronghold by storm. The fighting was brief but bloody. Vortigern was killed along with most of his men. Some of his druids escaped to the isle of Ynys Môn but Ambrosius, who was the elder brother, decided that too many lives had been lost already and chose not to pursue them. He was crowned High King at Stonehenge four weeks after, and it was Merlin himself who presented him with the royal and ancient British crown, first worn by Brutus the Trojan in the dim and distant days at the very beginning of our island's long, unfolding story. So Uther was crowned High King. But his coronation was a rushed and hurried affair, and he struggled for a while to set his lands in order, for the Saxons, Picts and Irish swooped down once more, hoping that Ambrosius' death had left the country rudderless and adrift. Uther was as strong as an ox and as brave as any man who ever lived, before or since. But he wasn't as mentally sharp as Ambrosius and he relied on Merlin a lot to help him make the big strategic decisions. But after a few months he was happy enough with his progress to declare a week-long coronation party at Caerleon. He invited all of his nobles together and their wives, and that was the first time he set eyes on Ygraine, the wife of Gorlois, Duke of Cornwall. Uther was impulsive and hot-headed, and he fell in love at first sight, showering Ygraine with attention and gifts. She complained to her husband, and Gorlois took her back to Cornwall and his ancestral seat at Tintagel Castle. Uther was furious and laid siege to the castle. Merlin counselled against it, as Gorlois was one of the King's best and most loyal generals. His castle was impregnable as well - perched high on the rocks, far above the waves. The only way in was to climb up a long, narrow causeway that only let one man pass at a time. Uther had brought ten thousand men with him but he might as well have come on his own for all the help such strength in numbers gave him. The siege dragged on for fourteen days and nights. Many lives were lost. Merlin decided to visit the King's tent and urge him, as strongly as possible, to make peace. But as he stepped into the March night he beheld a star shining above the castle which hadn't been there before. It was green and translucent and throbbed and glowed like a ruby or sapphire. Merlin ran his hand through his hair and wondered what it might mean. Perhaps it was a sign? He returned to his tent. Better wait a night or two and see if the star remained. And it was there the next night, and the one after that, and the one after that. Merlin knew then that it was indeed a sign and that the great king to come was destined to be conceived at Tintagel. But how was he to get Uther over the causeway and into Ygraine's chamber? 'What way might that be?' Uther asked wearily. 'I don't understand,' muttered Uther. 'Well, we'll see,' said Merlin. The guards waved them through, and Merlin showed Uther the door to Ygraine's chamber. He withdrew to the courtyard, watching and waiting as the scudding clouds raced across the sky. The star, he observed, was shining brighter than ever, sparkling and twinkling in the raw spring air. It was a long way back to the camp. When they got there, all the lanterns were lit and everyone was astir. Gorlois, inexplicably, had launched a night raid and had been killed in the subsequent skirmish. Uther was astonished. Gorlois was normally such a cautious general. But there it was, and one hour later Uther was back in the castle, not in disguise this time, but as himself - a conqueror. He stayed for a year and a day. Ygraine sorrowed grievously for her husband, but over the following weeks and months she grew very fond of Uther and they were married on Mid-Summer's Eve. He was aware from an early stage, of course, that Ygraine was pregnant. 'It is a mysterious thing,' she told him, 'that at the hour Gorlois was said to have been killed, he himself, or one exactly like him, visited me here in my chamber.' 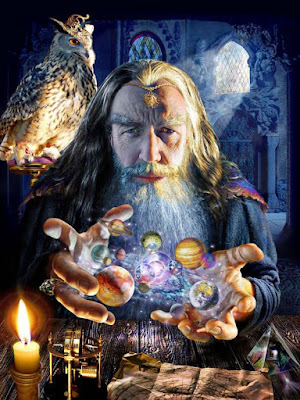 So Uther told her the truth - about the comet in the sky, Merlin's prophecy, and his own promise to hand the child over. Then Ygraine wept again. She had already lost a husband and now she was to lose a son. Yet she marvelled at the same time and wondered greatly at the extraordinary destiny predicted for the boy. Uther kept his word and handed the babe to Merlin on a frost-flecked late-December night. Ygraine had wrapped him carefully and tenderly in white swaddling clothes to keep him warm. Merlin held him in the folds of his cloak and headed down the sands via a path through the rocks he had made himself and that no-one else knew existed. At the bottom was a cave, which he had carved out of the rock, and in the cave was a pool, and on the pool a wooden boat, which Merlin had spent the last two months building. He stepped aboard, unfurled the sail and pushed out the oar. He was voyaging to a secret place that Blaise had told him of years before, where the wise women who came often to Ambrosius would bring the boy up until the time was ripe for him to appear in the world. Merlin rowed steadily for five minutes then turned around to look at the castle. It had disappeared into the night. Only the lanterns in the windows and the green star hovering above told him where it was. And as he looked he heard a noise - not with his ears but with his heart - far-away but crystal clear - the sound of falling towers and tumbling masonry. And he knew it was a sign and that Rome had fallen for the third and final time. He kept looking and the star seemed to grow and expand and change colour, so that it was as big as the sun and not just green any more but green, red, gold, blue and white, all together and all at the same time. It whirled and spun like a wheel of rainbow fire, faster and faster, fizzing and crackling, until it burst asunder into ten thousand shafts of light, a legion of shooting stars, filling the firmament and bathing the world in warm, rejuvenating light. And then, one by one, the spears of wondrous light dipped and fell into the sea - splash after splash after splash after splash, leaving silence and peace in their wake as an almighty hush descended. The silence of the Holy Spirit, thought Merlin - the richest, deepest silence, stillness and peace that he had ever known. He held the child tight in the crook of his arm, turned back to the sea and pushed out the oar again. And all he could hear was the beating of his heart, the lapping of the waves and the soft, rhythmic breathing of a new-born babe. Edited from Life between Death and Rebirth - a lecture by Rudolf Steiner from 1913. We will need to bring understanding to every human soul in its essential character. For this communion we can only prepare by gaining an understanding of all religious confessions. Prior to the Mystery of Golgotha this was not necessary, because the experiences in the spiritual world were each different then. Now it has become essential, and the correct understanding of Christianity is a preparatory step toward it. We cannot encounter what constitutes the essential being of Christianity in other religious creeds. It is not correct to place Christianity next to other religious creeds. Indeed, perhaps certain Christian confessions are narrow-minded. Nevertheless, Christianity - rightly understood - bears within it the impulse to grasp all religious creeds and tendencies. How has the Westerner grasped Christianity? Consider Hinduism. Only those belonging to the Hindu race can be adherents of it. If a racial religion were prevalent in Europe, for instance, we would still have a Wotan cult today that would be the equivalent of an occidental racial religion. But the West has accepted a confession that did not arise out of its own folk-substance. It came from the East. Something was accepted that could only work through its spiritual content. The Christ impulse cannot be sucked up into a racial or folk religion. One need not take an intolerant attitude toward other religions. The mission of Christianity does not consist in bringing dogma to people. Naturally the Buddhist smiles at a confession that does not even contain the idea of reincarnation. Such a confession must appear to him as erroneous. Christianity rightly understood, however, presupposes that every man is a Christian in his inner being. If you go to a Hindu and say to him, “You are a Hindu and I am a Christian,” it will be seen that you have not understood Christianity. Christianity has been truly understood only if you say of the Hindu, “Inwardly this Hindu is as good a Christian as I am. He has as yet only had the opportunity to become acquainted with a preparatory confession. I must endeavor to show him where his religion and mine correspond.” The best thing would be for Christians to teach Hinduism to the Hindus and then attempt to take Hinduism a stage further so that the Hindu could gain a point of contact with the general stream of evolution. We understand Christianity only if we look upon each individual as a Christian in the depth of his heart. Only then is Christianity the religion that transcends race, color and social position. That is Christianity. We enter a new age. Christianity can no longer work in the way it did over the last centuries. It is the task of anthroposophy to bring about the new understanding of Christianity that is needed. 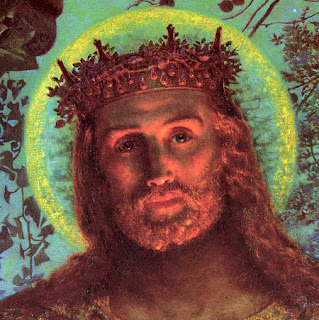 In this connection the anthroposophical view of the world is an instrument of Christianity. Among the religions of the earth, Christianity has appeared last. New religions cannot be founded anymore. Such foundations belong to the past. They followed one another and brought forth Christianity as the last flower. Today the task is to form and apply the impulse of Christianity. That is why in our spiritual scientific movement we endeavour to consider all the religions of the world more consciously than heretofore, and in loving participation. In this way we also prepare ourselves for the period between death and rebirth when we experience loneliness if we cannot perceive and have no access to other souls within this realm. This excerpt, and the lecture it comes from, is a representative sample of Steiner and encapsulates my attitude to him. I am puzzled by his having not mentioned Islam - which came after Christianity and is now at least as large a religion and growing fast by natural increase and conquest. But at the time Steiner was writing, it did look to many Western people as if Islam was on the road to extinction - certainly it was at its lowest ebb around 1900. Yet, ultimately, any Christian would have to agree with Steiner that Christianity is the 'last' religion, although its nature has developed considerably. Since the Christ has united Himself with the earth, we have to gain an understanding on earth for the Christ. We have to bring a Christ understanding with us because otherwise the Christ cannot be found after death. That is the important factor — that the understanding of the Christ must be stimulated on the earth. Only then it also can be preserved in higher worlds. The Christ impulse stands as a fulcrum at the center of earth evolution, the point from which the ascending curve begins. To maintain that Christ can appear repeatedly on earth is like saying that the beam of a balance must be supported at two points. But with such scales one cannot weigh. A conviction of this sort is as senseless in relation to the physical world as the statement made by certain occultists that Christ goes through repeated earth lives. One has gained an understanding of the Christ impulse only if one is able to grasp that the Christ is the only god who has gone through death, and hence first had to descend to the earth. (Note: This post is something in the way of a companion to the previous one). 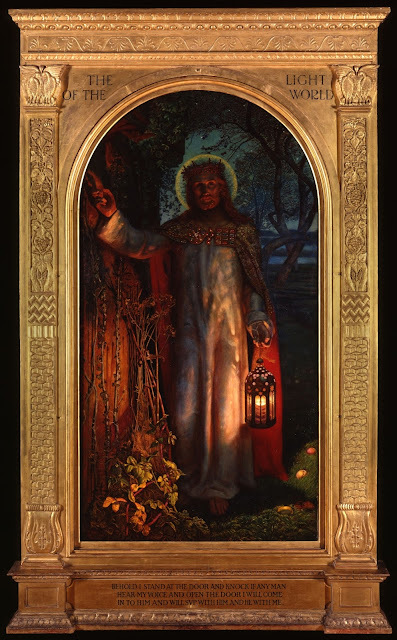 William Holman Hunt painted more than one version of his famous painting The Light of the World. The original, painted in 1853, is at Keble College, Oxford, and there is a second one at Manchester City Art Gallery. But my favourite is the one below in St Paul's Cathedral. This was painted fifty years after the first in collaboration with Edward Robert Hughes, and is thought to represent Holman Hunt's last word on the subject. It's my favourite because of Christ's face. It's in shade in the reproduction above but here it is close up. The painting shows Christ knocking at the door of the human soul, and is based on the text from Revelation. "Behold I stand at the door and knock; if any man hear my voice and open the door I will come in to him, and will sup with him and he with me". It is rich in symbolism. The door is covered with overgrown weeds indicating that the spiritual life of the individual concerned, who is Everyman, has been neglected. It has no handle, showing that it cannot be opened from the outside. We have to make the move to invite Christ into our heart. The night sky with a bat flying at top left above the midpoint between Christ's hand and head (obscured here unfortunately but you will see it if you zoom in) shows that the hour is late, and the fallen apples by his feet refer back to the Garden of Eden and our fall from divine grace. The painting is called The Light of the World referring to the passage from St John in which Jesus says " I am the light of the world. Whoever follows me will not walk in darkness, but will have the light of life." There are two lights depicted. The first is that of Christ himself, his halo, and the second is the lantern he carries which is what shows us the way to eternal life, and maybe eventually is passed to us so that we too may have the light within ourselves. Spiritual truth and reality is best understood in terms of light, and Christ is spiritual light personified. I don't mean this as a metaphor. I think it is literally true. This painting became extraordinarily popular in the early 20th century. It was described as a sermon in a frame, which indeed it is, and it even went on a world tour, visiting many towns in Canada, South Africa, Australia and New Zealand, and supposedly being seen by millions of people in the process. Reproductions hung in church halls, schools and nurseries. I venture to say it might have inspired many with a greater love for Jesus Christ than countless more conventional sermons achieved at the time. Such is the power of the true artist. Everyone comes to spirituality from a slightly different perspective, reflecting their life conditions, personal inclinations, experiences, upbringing, culture etc. So we will all have a slightly different take on it. That's only to be expected and more of a good thing than a bad since it prevents petrification of truth and keeps multiple expressions of it open, advantageous because no one expression can capture all of it. Nor can multiple expressions for that matter but they can incorporate different sides. But the fact of these various spiritual perspectives and expressions cannot be taken too far. Truth is truth. There is only one truth even if it can take different forms. Moreover all truth for us human beings is centred on Christ who embodies it, who actually is it. That is why an image that came into my head seems a viable one. It is this. Ignore the colour. That's not relevant. But what I thought was that human beings come at spirituality from many directions but ultimately these must all converge on Christ who is at the centre of this symbol. 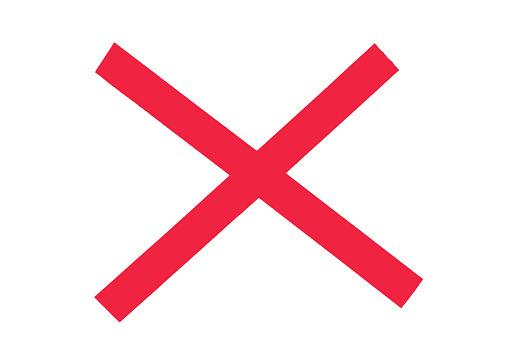 So the lines on the left of the X represent human beings in this world. The image only includes the outermost lines. You have to imagine multiple lines between these two representing the great variety of different people. But they all have, or should have if they are to conform to the real, a common focus which is Christ at the centre. He is the doorway through which we all must pass to gain entry to the kingdom of heaven which is on the right of the X symbol. Once through that door we may all find diverse expressions of our realisation but these all are coloured by and centred on the reality of Christ. Going through that doorway in the centre indelibly marks the soul with its quality. You might say that, according to this symbol, Christ is not actually in heaven himself but it's only meant to be a representation of how human beings approach truth and of their access to it. It only shows Christ in his aspect of doorway to reality. And the fact that it looks a bit like the cross of St George turned to one side is coincidence. At least, I think it is. 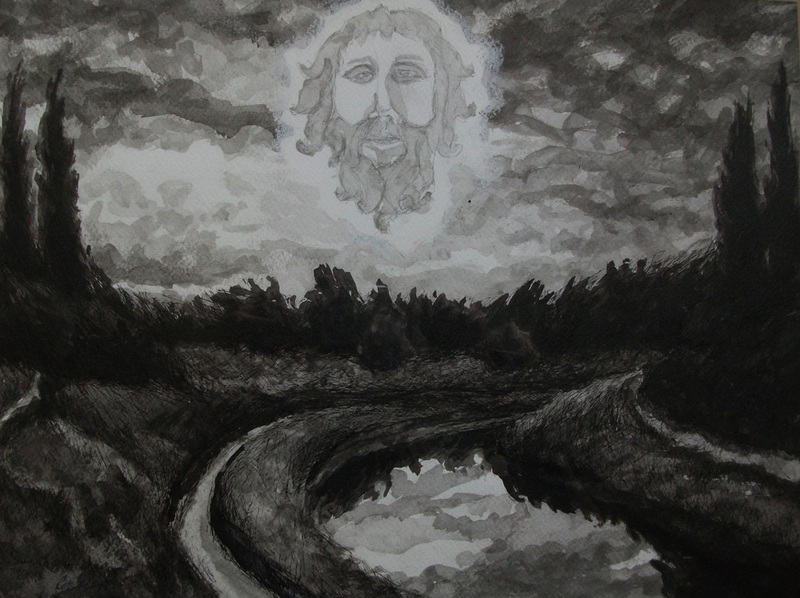 From Merlin the prophet and his history, by Geoffrey Ashe, 2006. Merlin stands alone, and there is nobody like him. The Britons had a paramount god who was comparable to Apollo - who was, among other things, a god of inspiration and prophecy. Britain was his 'precinct' or temenos, and he was Britain's tutelary deity. This god has a special association with Moridenum (Carmarthen, Wales); and thus acquired the sobriquet Myrddin, which applied both to himself and to those inspired by him. Ambrosius and Lailoken were Myrddin-men, or simply Myrddins. Geoffrey of Monmouth picked up the sobriquet and made the change from Myrddin to Merlin. There were thus several Merlins, perhaps many. But if we want a Merlin par excellence, the original of the main legend, the place to look is Dina Emrys. Here the Merlin who speaks the prophecies is localised at a place which is known to have been occupied at the right time by someone who could be identical with him. Here story joins hands with archaeology. As for Merlin's final fate, preference is a matter of taste... Legend traces him in several directions, to several eventual ends, after his triumphant years as royal adviser and magician. He dies at Marlborough and is buried under an inordinately big mound. Or he passes into suspended animation in Cornwall or Brittany. Or, Merlin is alive and well, and living on Bardsey Island. His dwelling is an invisible house of glass. Some say he is asleep, but he may not be. If awake and active, he is not alone: he has nine companions. Merlin is the guardian of the Thirteen Treasures of the Island of Britain - things of power that embody Britain's ancestral magic. Among them are the Chessboard of Gweddolau, the Chariot of Morgan the Wealthy, the sword of Rhydderch the Generous, a cloak of invisibility that once belonged to Arthur, the red coat of Padern, horns of plenty and talismanic objects that test valour and virtue. No one knows what the Treasures look like, and they may have the same shape-shifting qualities as their custodian. Who else, indeed, would have that right? In a recent post on his blog Bruce Charlton made the following point. The original post is here. Bruce wrote, "If we challenge only one aspect of the falsehood, while continuing to accept another falsehood, then we are still living in falsehood. Only when all of the foundational falsehoods are challenged simultaneously can we escape the Matrix." This is a perennial problem in the world of spirituality and religion. We may break out of the prison of materialism and atheism, and adopt a spiritual world view of some sort but this may well be based on illusion. Just because something is called spiritual does not mean it is true. There are many people propagating half truths these days, partially true but incomplete spiritual speculations emanating from the lower mind. I expect that's always been the case but the problem is greater now because there are so many people who take their spirituality from multiple sources, including not just revealed religion but personal experience and conjecture too, and mix them together to form a subjective version of what passes with them for truth. I admit I do that to an extent myself because there is no one thing that incorporates the full truth in this world, but I would also maintain that there is a big difference between someone who does this under the guidance of an awakened intuition and someone (to be honest, the majority) who does this from the more limited and less spiritually objective position of their own mind and personal preferences. False awakening is different to partial awakening. However in one sense all awakening is partial but there is that which is partial but sufficient for our current stage of development, and then there is that which is incomplete even for where we are now. Usually the latter is still dominated by what Bruce has called residual positivism in which the individual adopts a spiritual position but fits that into his pre-existing worldly, materialistic assumptions, whether these be inspired by leftism, Darwinism, feminism or any one of a number of currently fashionable ideologies. Of course, the correct procedure is exactly the opposite to this. Spiritual awakening requires one to reassess all one's previous assumptions and to see them from above. If it is cut down so that it accords with already existing beliefs, it is fairly useless. That is because the point of a spiritual awakening is to orientate us towards the soul, the spiritual component of our being. If this soul is seen in the light of the worldly self then it is not seen at all. The soul is not an extension of the earthly being but the true spiritual self that exists beyond that and above that, and which is our connection to God. The fallen earthly self is always wrong and must be renounced. Any spirituality emanating from this fallen self is a false spirituality. False awakening is similar to this. It is basically adopting a spiritual perspective on life but within the framework of a false metaphysics. I believe it was Chesterton who said that a thing stands straight at only one angle but will fall at many. There are indeed many approaches to spiritual truth that do not coincide with reality but are outgrowths of human experience and mental formulations. Again, you might say that no one has a completely true metaphysics, but there are those that do correspond more closely to truth and then there are those that deviate from it. Whether these originate from human error or demonic manipulation is not my concern here (actually, they originate from both) but the fact is that a false metaphysics will lead to a false or inadequate spiritual practice. False metaphysics tend to come from one of two misconceptions which are an insufficient understanding of transcendence and an insufficient understanding of immanence. Modern Christianity suffers from the latter, New Age religion and neo-paganism from the former. A rounded metaphysics includes both transcendence and immanence but, and this is important, it puts transcendence ahead of immanence, that is, it recognises that God within is an expression of the Creator who is the source of all and must come first. Put another way, you could say that those who teach immanence as primary (many Eastern religions do this) do not understand transcendence properly but those who put transcendence first also acknowledge immanence. Or should do. They may not if they lack imagination but they do at least have things the right way round. For the two are complementary but not equal. God out there is the cause of God in here not vice versa. The transcendent God is the source of God immanent. So, a full and proper spiritual awakening requires at least two things. One, the recognition of God as Creator, and two, the understanding that he is present within us as the source of our being. Our task is to increase awareness of both of these perceptions. It is to see God as present in ourselves, in the world (nature) but, pre-eminently, as the Creator responsible for all this. Much more could be said but this, I believe, is a bare minimum for true awakening. False awakening can usually be identified because it materialises spirituality. It fits into the modernist ethos without too much discomfort and does not demand radical transformation. And there is one other easy way to identify it. It is motivated not by love of God and wanting to do his will but by spiritual desire. That is, the individual seeks to get more than to give. His spirituality is a search for personal benefit and not a means to express his love of truth and God. I believe that it is dedication to Christ that safeguards us from spiritual selfishness. I dare say that for us in the West there is no true and complete spiritual awakening that does not have Christ at its core. Any awakening without Christ is at best partial because he is the summation of all spirituality. I know a lot of people will resist that idea, probably in reaction to the huge influence of Christianity in the past, but it would be a pity if they rejected truth because of human failings in seeking to express it. Of course, there are other valid forms of spirituality in the world but they are all incomplete without Christ at their centre. In effect, they all need baptism like the paganism of old, though I would say this is now an inner thing and does not mean that they should all be absorbed into Christianity as it currently exists externally. 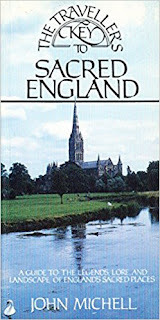 The Traveller's Key to Sacred England is a guide book by John Michell, which focuses on the kind of English places likely to be of interest to Albion Awakening readers, and provides the kind of information Albionites are most likely to value. It would be an ideal book to give ideas of 'what to do' for someone visiting the country, or a native thinking about where to take a holiday. Michell's comments are beautifully expressed, and generally very sound (at least as-of about thirty years ago - of course, some places have 'gone off' since then). St Catherine's Chapel Guildford: At the foot of the hill is the site of a religious establishment which vanished so long ago that no one knows whether it was a priory or a nunnery. The stretch of Pilgrim's Way which passes it goes between charming old cottages to the river, where the pilgrim's ferry has now been replaced by a footbridge. On the right of the path, just before it reaches the river, a spring well up from the bank. This is the holy spring of the Virgin Mary that refreshed every pilgrim on the way to Canterbury. Its waters are clear and refreshing today. Sherbourne Abbey, Dorset: The abbey was rebuilt in the twelfth century, and in the fourteen a parish church, All Hallows, was added on to its west end. Its parishioners used the abbey font for baptisms until 1437, when a quarrel broke out between the people and the monks... When a new font was set up in All Hallows, the monks smashed it. A riot broke out, and it is said that a priest of All Hallows shot a flaming bolt towards the abbey, which was then being rebuilt. It caught fire and was largely destroyed... A boss in the choir vault [of the rebuilt Abbey] shows the flaming arrow, shot by the clergyman of all Hallows, which caused the burning of the abbey. The monks of the time must have had great tolerance and humour to allow this event to be commemorated so soon after at had happened. Mother Shipton's cave and petrifying well, Yorkshire: Mother Shipton, born Ursual Sontheil in 1488, had the proper parents for a girl of supernatural powers, her mother being an outcast beggar woman and her father a local spirit or demon who haunted the forests outside Knaresborough... She is said to have been a hideous little creature, deformed , shrivelled and lame, with a huge twisted nose and pimples that were said to glow in the dark. Even so, she found a husband and became Mrs Toby Shipton. As compensation for her appearance, Mother Shipton had second sight and the gift of seeing into the future... The Major triumph of her lifetime was over the powerful Cardinal Wolsey, who she had prophesied would never enter the city of York. Hearing this, Wolsey swore that not only would he enter York but he would go on to Knaresborough and burn Mother Shipton as a witch. He was... 12 miles from York when the king's officers arrested him on a charge of high treason. He died at Leicester on the way back to London. The mizmaze on St Catherine's Hill, Winchester: ... the date and the ritual purpose of the mizmaze are unknown; estimates of its age vary from three hundred to more than a thousand years. Treading the maze, by walking the furrows between its raised banks, is a mystical and therapeutic experience. It may be that in following the spiral patterns of natural growth and energy, one orders the mind and attunes oneself to nature's rhythms. The labyrinths which sometimes occur on the pavings of medieval churches traditionally represent the pilgrim's journey to Zion. In sum - people who like this sort of thing, will find this the sort of thing they like.